November 2017 Cockeysville Maryland. 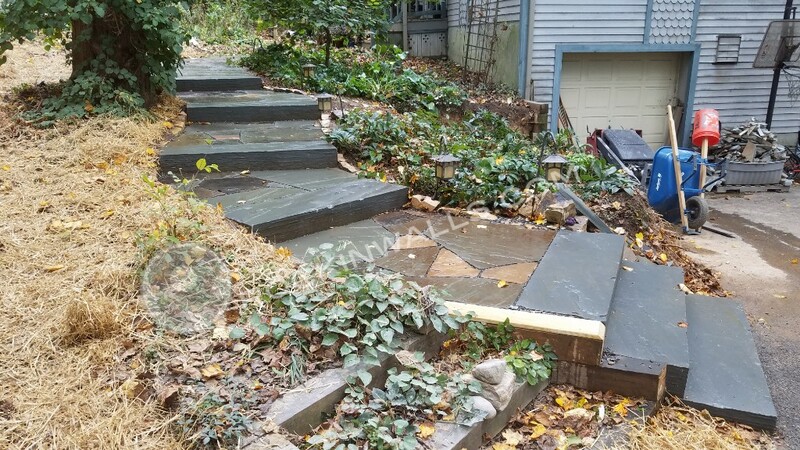 Part 1 - Makeover of 36' long of lower dry laid natural stone walkway to house with seven steps. 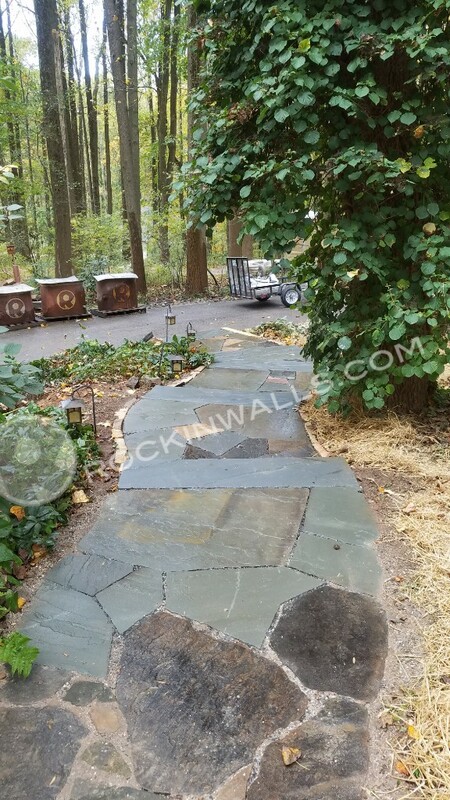 The stone of choice being native to our region Balducci Colonial Bluestone. Details: Steps 5' long 18" tread with 7" rise natural cleft tops with thermal faces. 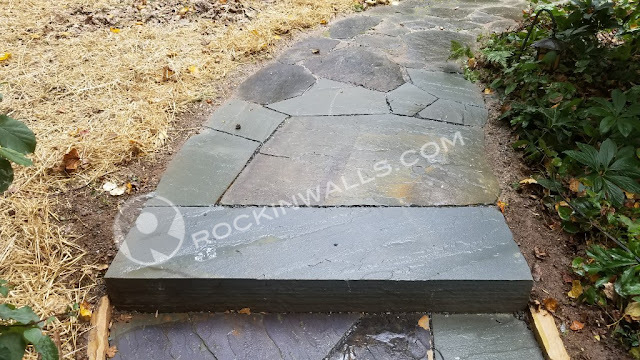 The 5' wide walkway was mixed with some of the old thicker Western Maryland Red and newly added Colonial Bluestone sheet stock (3" average for thickness and overall size). All walk stones custom cut to size and shape for a one of a kind mosaic pattern. 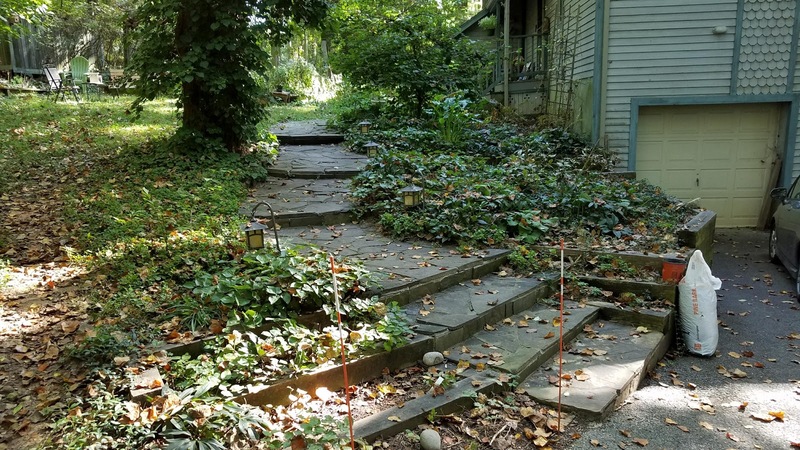 Setting this walk above traditional cookie cutter squares and rectangles patterns. 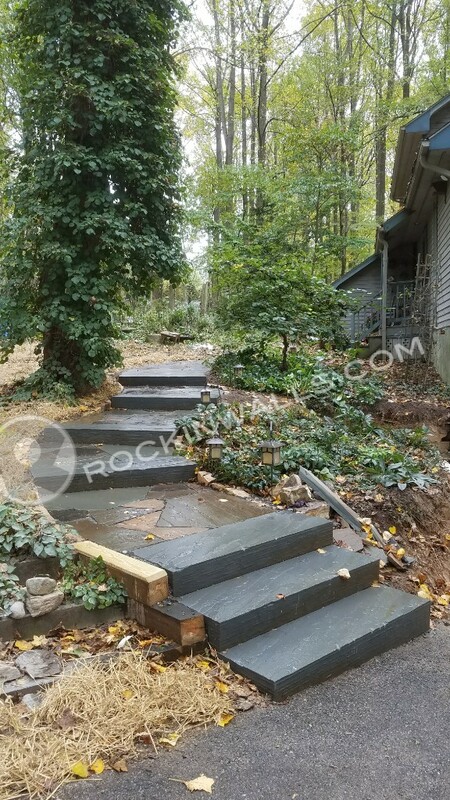 Typically used my landscape companies for easy. While natural stone can cost a more than pavers it will never be dated, nor will you have the undesirable UV fade of color. 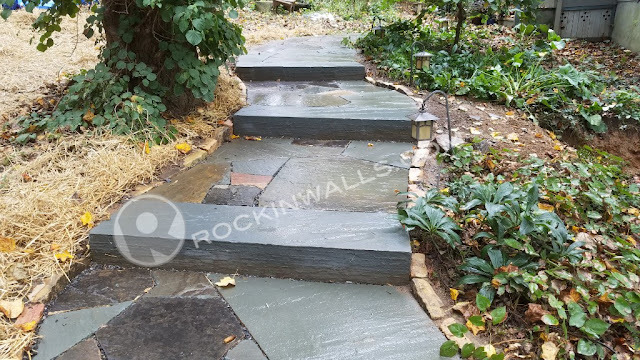 Other contractor's pricing came in for replacement of wet laid stone from $8000-$13,000. 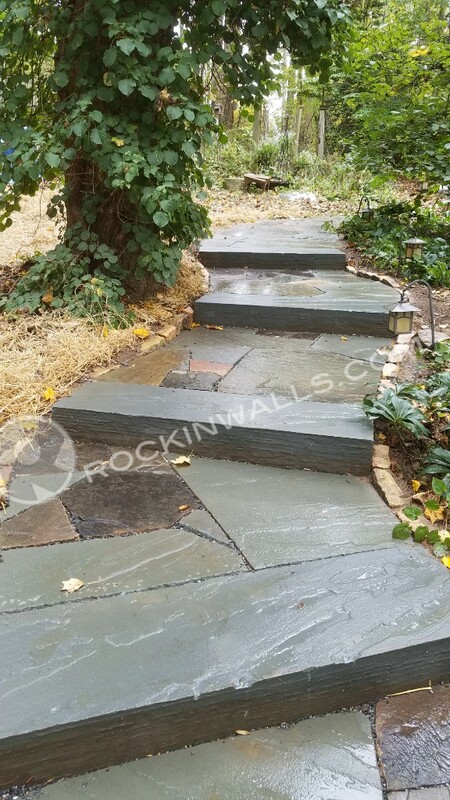 The clients choice me based on my ability to create a lasting walk that made a statement. With a BFA degree in Visual Communication in Graphic Design from Maryland Institute College of Art - MICA. 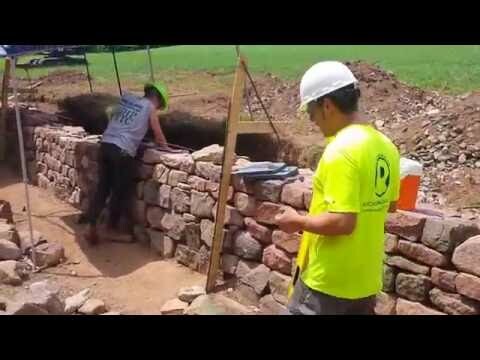 I'm able to bring my years of training both in the arts and in the craft of dry laid stone. 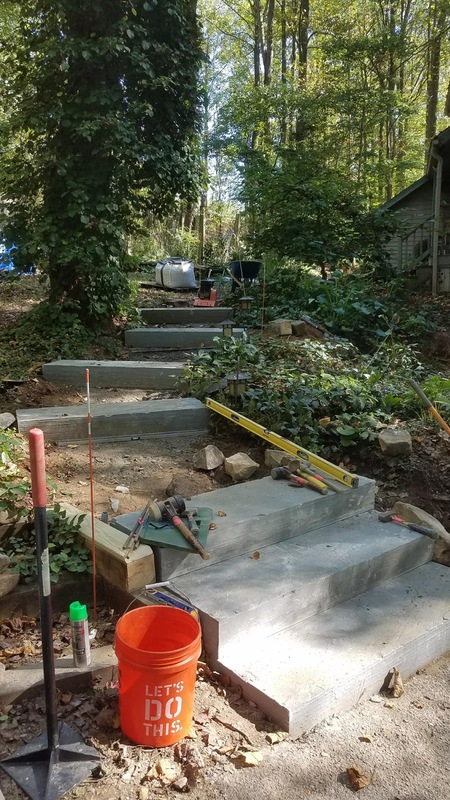 Traditional contractors can't always seeing the whole project. They just don't have proper visual training. It's not just about the services I can provide but really how it works with the setting it's in. I love bring life to a space. 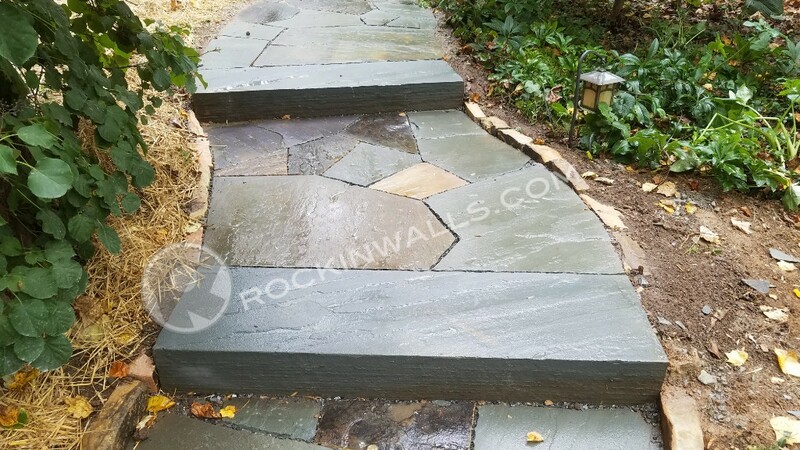 Stone helps me create that beauty for others to enjoy. This is my medium to painting. As seen in the many photos below. Enjoy. I'm always amazed to see what others sometimes think are good ideas?! This by far was different. It was a nice attempt for a great concept of a walkway. The steps except the last few are all dry laid. There are several issue with this walkway, 1) thin stone 1 inch average, 2) size of stone over all 8" average, 3) Bedded on only stone dust, 4) Gator Dust - to attempt to keep everything together. All of which makes for a very crappy walk which didn't last. 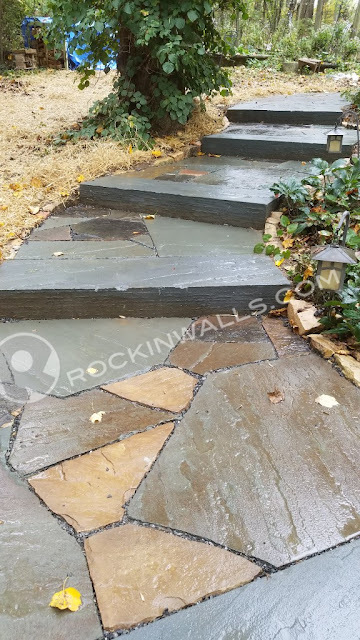 Stone over time began to lift and float causing trip hazards. How can you have a walk if you have to watch every step you take. Is that a POLICE SONG?.... "Every breath you take - Every move you make - Every bond you break - Every step you take - I'll be watching you..."
Anyway as I was saying...... 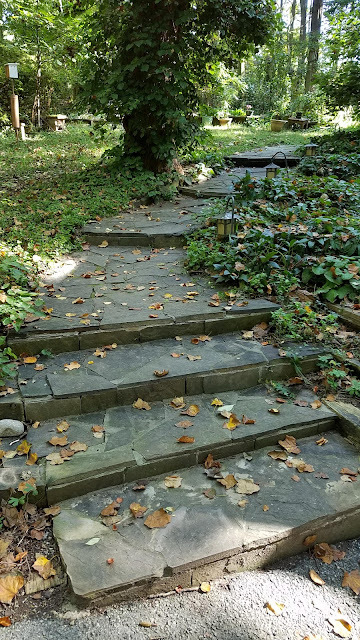 The last thing that got me scratching my head was the vertical stone for each of the steps. You can't make an edge to hold back material ( ie think of a sand box you have to have walls to keep the sand in) with something so thin! It doesn't work. I Yeah Yeah Contractor's? Two contactor had been hired to make this. The first to build it. The second to ill attempt to add a well needed step and patch up the first guys shoddy work. Then the second fellow who came out added some steps using Stone Tiles?! OK whats next. 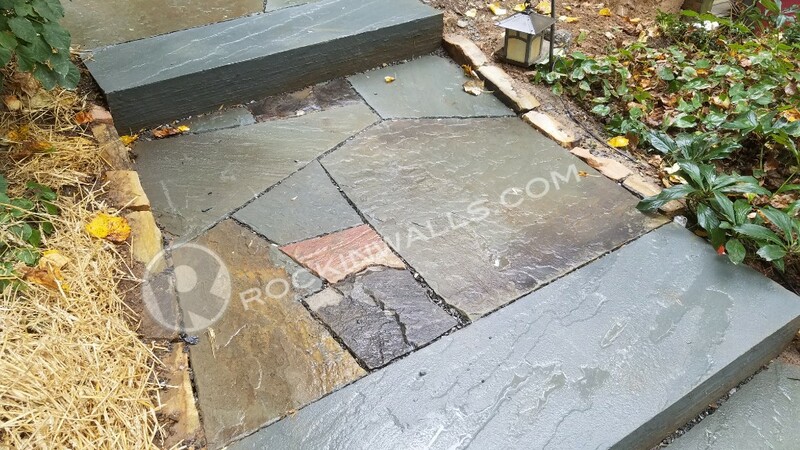 The bedding for this old walkway was made up of stone dust about 6+ inches way too much. Normally a good base is solid soil possible or 4 inches of crush and run compacted than about 1-2" adjusting material. I prefer 3/8 stone called #8's in my area. Coarse sand for concrete can also work well depending on your stone you've picked. 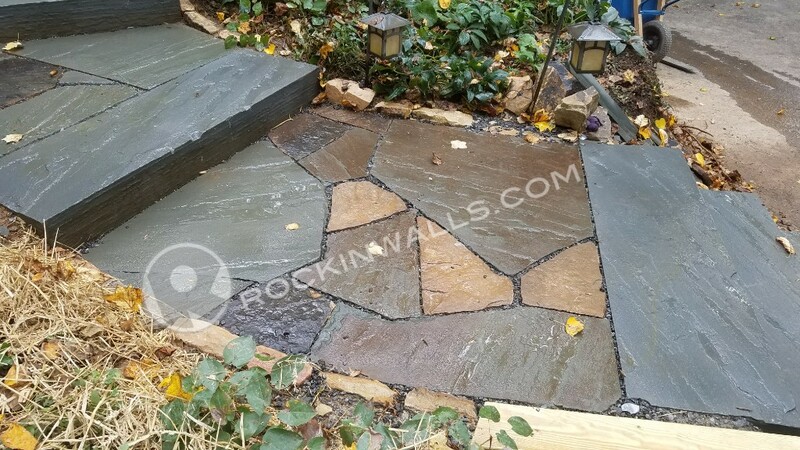 For example stone like squares and rectangles bed nicely on coarse sand. WAIT WAIT I'm I speaking English? Let me explain further below. Figuring it all out. Start at the top going down into the earth. 3) Base - Crush and Run compacted on average around (4") note this can be earth in some areas base on the soil type. Add up all the inches you get 9" you must dig out in theory. Good solid soil? Alternative method on earth no Base. 2) Bedding 3" - 4" of 3/8ths Washed! aggregate. Why washed? In aggregate or stone dust you have what is called Fines. This is the stuff that looks like stone powder or fine sand. This can hold water. In winter when you have frost heaves it is likely the moisture in the sand or stone dust to cause your stones to lift. I'm not going to bore you with all the project pictures since it's really self explanatory. 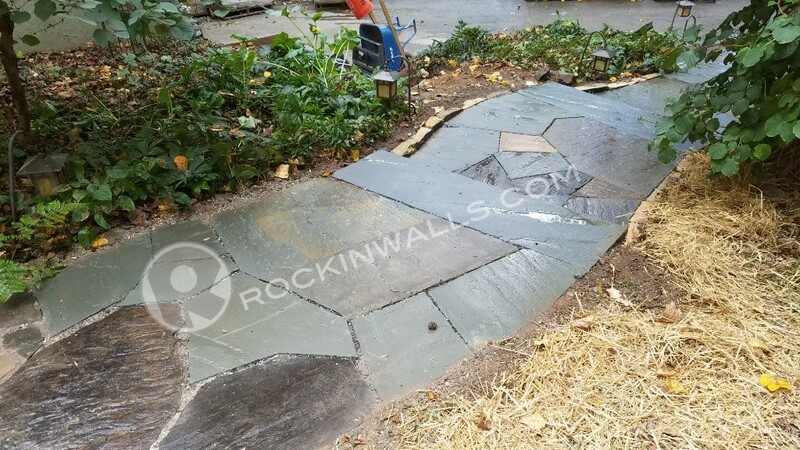 I started with the strip out and palletizing of all walk stones. Demoed the steps and got my grade to good solid soil with no stone dust Amen. Compacted the soil where needed with a gas powered plate compactor. 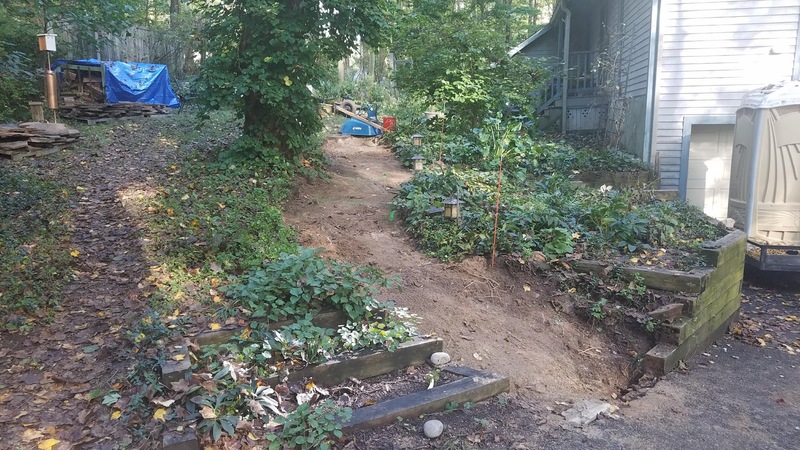 Next I set all seven steps with my Mini Excavator. I was tring to complement the existing walkway with the river feeling. Keeping in mind if you didn't notice the Large tree. Which always has large roots. Which means you need to work with mother nature. This was a big concern early on since the client told me the last contractor had to cut some of roots. Best to work around things. I had every intention to make my design flex around the out come of where the roots were. Next it was time to build with Colonial Sheet stock. My dingo machine was very handy to help me move these. Some weight as much as 200 pounds. Ya they are not moving any time soon. 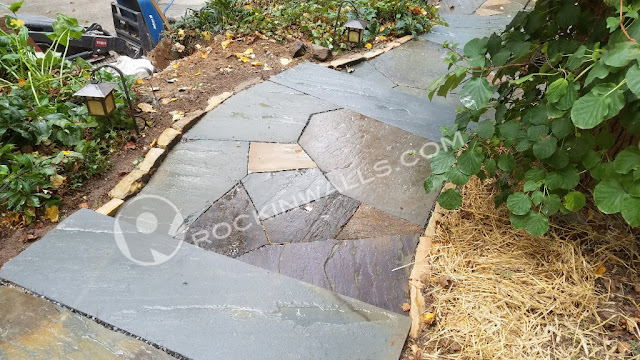 Each stone had a pattern (Angler - NO Curves) made prior to cut. Then cut with a large gas saw giving a nice tight fit to each neighbor. Next hand chiseled edges for a more finished look. You might notice a few tools let me give you a quick run down. The PVC pipes are for rolling stones around. Contract buckets with extra bedding 3/8th washed stone, levels, pool trowel, tape measure, sharpy, scissors, clear plastic, Trow and Holden trimming hammer, Spartan Tracer, 2 pound hammer, work gloves, 3 & 8 Pound Wall Mallet from Pave Tech, rapid digger. These are just a few of the most used. Plastic Conduit was fitting behind every other step in order to fit low voltage path lights. 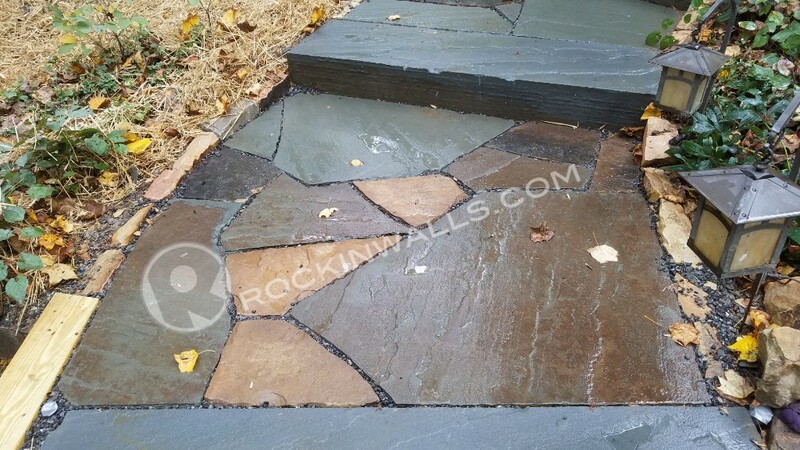 You will also notice I used a very simply West Mountain stone for cobble edging. As you can see each section has there own personality. At the top I blended back into the old walk which was not part of the makeover. The main reason for this was part 2 a new upgrade to the timber retaining wall. Not to mention this section except a few stones was not too bad in comparison to the section replaced. 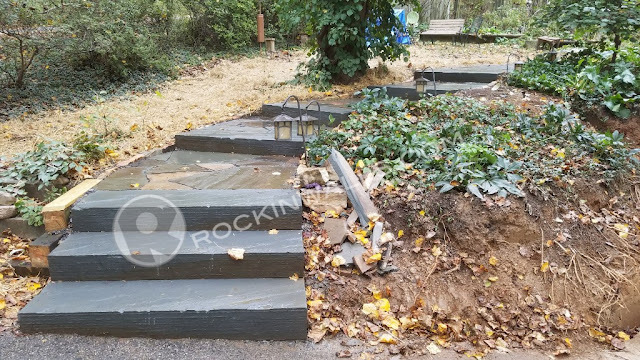 This upper section had the thickest of my stones which was 4" as you can see knowing the step is 5' long. You get a good idea just how large in overall size this was. Now imagine having to set it - then lift it to add or remove bedding stone under it. Then do this again and again to get it just right. Did I mention I work alone? 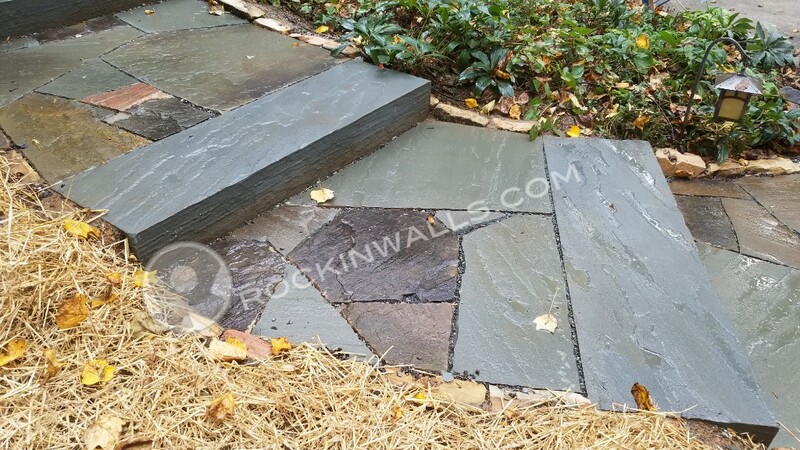 Yes naturel stone can me costly in labor too since each has to be handled differently than the last. 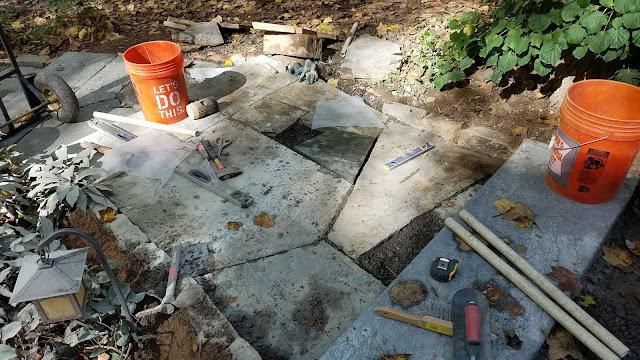 You also may not have noticed I placed large stone in each of the areas of travel to help limit the chance of lifting over time due to frost heaves. 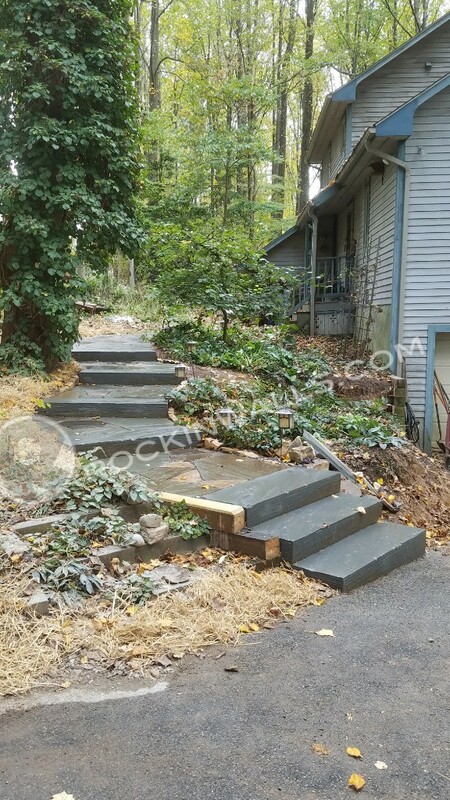 Part 2 New dry laid stone retaining wall missing in photo old timber retaining wall to right of steps. The conclusion. While there are many pro's and con's when choosing a Dry Laid or Wet Laid walk. I prefer a Dry Laid since it is is a flexible free draining and easy to repair, replace or make adjustments. Without the likelihood of a complete demo of the site going to a landfill. Do you have a old dry laid stone walk or patio in need of stone adjusting and setting. Let me help you put it back into shape. 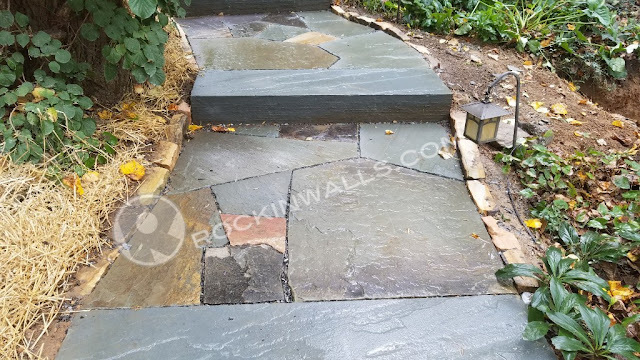 Most Bluestone Patios typically need adjustments every 10 years when bedded on sand in our area.